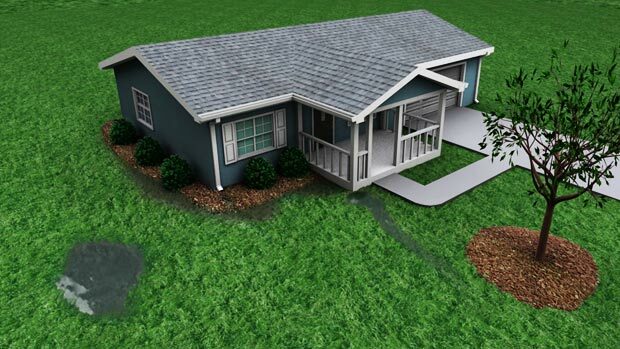 The cause of standing water is typically having a low lying area in a yard or garden surrounded by higher elevation ground, which collects standing water during rain and wet periods. By installing Big ‘O’ perforated pipe below ground, you can create a French drain that will divert the water away from the area, and promote a dry usable surface, resolving the standing water problems. Locate an area that is lower in elevation than the standing water, where the water can be diverted. Dig a trench at least 8-12 inches below ground that h as a constant downward pitch to create a gravity fed water flow. 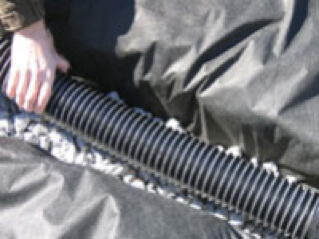 Install Big ‘O’ perforated pipe, or perforated with sock pipe in the ditch, surrounded with at least 4” inches of course gravel often referred to as ¾ stone. Enclose the pipe and stone with non-woven geotextile and cover the area with topsoil. Result: The water will be absorbed into the pipe and flow downward to the area you designate. Multiple lines can be tied together for standing water drainage using a variety of T or Y couplers.